What do we mean when talking about TMJ pain? The temporomandibular joints (TMJs) are better known as the jaw joints. Temporomandibular joint disorder (TMD) is any number of problems that can arise in the TMJ joints, causing pain and dysfunction. 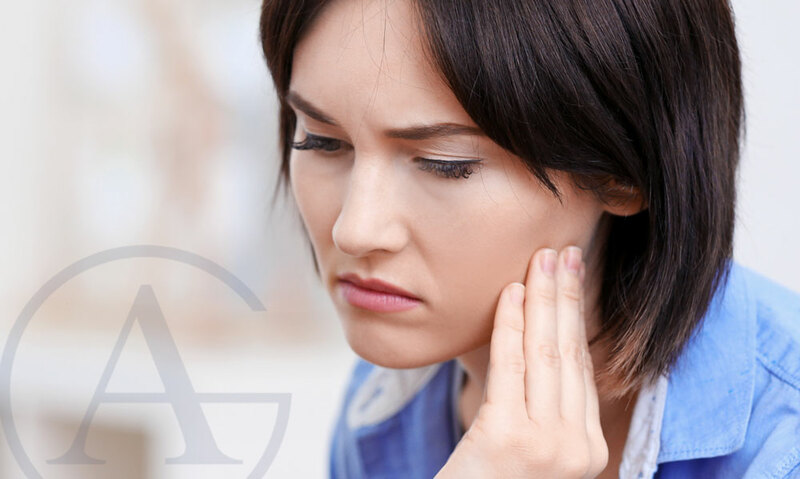 You may hear TMJ and TMD used interchangeably, but when speaking of jaw issues, both terms refer to soreness, pain, inability to smoothly move the jaw, clicking, or locking. Many patients suffer mild cases of TMD that occur infrequently and that are characterized by mild TMJ pain. Other patients encounter severe pain and great difficulty when opening and closing their mouths. While TMD is rarely life-threatening, the condition has been known, when left untreated, to progress to other potentially deadly diseases like sleep apnea and eating disorders. We will explore possible TMD treatments below, along with any drawbacks of each. Of course, if you’re experiencing TMJ problems, you should always consult a dentist with experience in TMD and its treatment. For very mild and infrequent TMJ pain, over-the-counter medications may be sufficient. These medications will typically be non-steroidal anti-inflammatories (NSAIDs), like ibuprofen or acetaminophen. Note that these drugs will likely be of little use with intense or persistent pain. Extended NSAID use is not a good idea, as these medications can irritate your stomach, and there are some medical conditions in which NSAIDs are contraindicated. Always let your doctor and dentist know before starting any NSAID, and follow their instructions, as well as the label directions. Physical therapy is available for TMD, but not every physical therapist offers this treatment. You can get a referral to a qualified physical therapist from your dentist or doctor, but you should know that your insurance may not cover the therapy. Once you find a dentist with experience in TMD, ask them about home exercises. No, you won’t be lifting weights with your teeth. Instead, your dentist will provide you with information and guidance on jaw movement exercises you can perform to limber your TMJs and hopefully reduce pain. Many arthritis patients find relief by applying heat to sore joints. Arthritis can be a cause of TMD, and some TMD sufferers are also able to control their pain with heat packs to either side of the jaw. Just be sure not to apply too much heat or for too long. Check your skin every few minutes to ensure that it is not red. If it is, discontinue the heat applications. Stress is another major cause of TMD. People tend to clench their jaws or to grind their teeth when they are frustrated or angry. This is called bruxism. You may even be performing these actions in your sleep without realizing it. Despite the myth, grinding your teeth does NOT straighten your jaw. In fact, bruxism can cause your bite to become misaligned. Decreasing your stress may help with the problem. If lifestyle changes are insufficient or not possible, you may need psychological or psychiatric treatment. Talk to your family doctor about these issues. Botox® has been used for years to smooth wrinkled faces, but it has a number of other applications, including migraine treatment. There has also been some success with using Botox to treat TMD, but this use is not approved by the FDA. That does not mean that Botox is ineffectual or dangerous for TMD treatment. It only means that the FDA has not yet fully evaluated this treatment. There was an animal study that raised concerns about long-term use of Botox® in the jaw. The study demonstrated bone loss that could potentially be a problem in humans as well. Some TMD patients with severe pain or with a locked jaw will visit their local ER. But, emergency rooms are intended for acute care and not as solutions for chronic conditions. If you go to an ER with TMD symptoms, they may be able to give you pain medication or a muscle relaxer to temporarily relieve your symptoms, but they will not be able to offer treatment for your underlying problem. Depending on the underlying cause of your TMD, treatment with prescription medications like arthritis drugs, muscle relaxers, and pain medications may be appropriate. Again, though, these medications will only address the symptoms and not the cause. Also, extended use of some of these drugs may be dangerous. Talk with your doctor or dentist if you’re experiencing severe or persistent symptoms from your TMD. Surgery is never a conservative option and should be the last choice for TMD problems. According to the National Institute of Dental and Craniofacial Research, the efficacy and safety of jaw surgery for TMD is not yet backed by any clinical trials. Also, patients that have surgical replacement of their TMJs may still suffer from significant pain and jaw damage. Splints and nightguards can be provided by a dentist who has experience in treating TMD, and both options are considered non-invasive treatments. A removable mouth splint will help take pressure off your TMJs, and a nightguard will protect your teeth and jaws against nighttime tooth grinding. Both of these treatments have good success rates and few drawbacks. Colgate. “Treatment of Temporomandibular Joint Disorders” November 16, 2018. National Institute of Dental and Craniofacial Research. “TMJ (Temporomandibular Joint and Muscle Disorders).” November 16, 2018. Mayo Clinic. “TMJ Disorders.” November 16, 2018. Mouth Healthy. The American Dental Association. “TMJ.” November 16, 2018. The TMJ Association. “Is Botox Safe and Effective for TMD?” November 16, 2018. The TMJ Association. “TMD Treatments.” November 16, 2018.